Until Halo Top came along, low-cal ice cream was greatly maligned. But that brand, started in 2012, has become a juggernaut: Sales of its waistline-friendlier pints soared by 2,500 percent in 2016, and last summer, it became America’s top-selling ice cream. The established players in the ice-cream game have noticed. 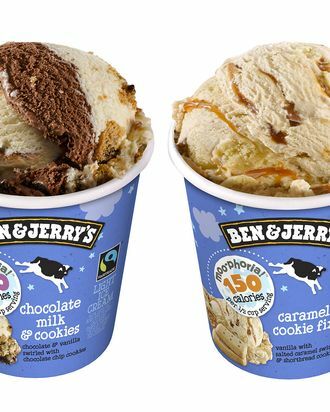 And today, Ben & Jerry’s unveiled a copycat line of its own called Moo-Phoria. The line includes three different light flavors that don’t sound light at all: Chocolate Milk & Cookies, Caramel Cookie Fix, and P.B. Dough. The flavors have 560, 600, and 640 calories per pint, respectively, or 140, 150, and 160 for each half-cup serving. For those who keep track of such things, that is fewer than other Ben & Jerry’s flavors — a pint of Chubby Hubby is 1,360 calories — but not as low as Halo Top’s. Also, exactly like Halo Top, the Moo-Phoria ice creams slap a calorie count right on the front of the label. (Ben & Jerry’s suggests that this is to remind fans not to eat the whole pint in one sitting, which is sound advice.) All three flavors debut in grocery stores this week.